OLDSCHOOL D&DSTYLE TEXT ADVENTURE WITH MODERN TWISTS! If you like oldschool D&Dstyle RPG games where you make the choices for the main character, this is for you! Play a wizard, a succubus, and a rogue in this epic series of textbased games. Here, oldschool doesnt mean primitive. There are hundreds of achievements to uncoverfrom the silly and surprising to the epic. As you make choices, stats go up and down, with rarely an instant death‌. You have ready options for going back on choices while gripping you with a sense of suspense and challenge. 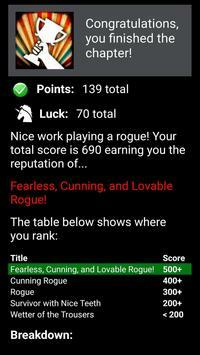 Medieval Fantasy RPG is deadsimple to learn, yet hard to master. You read and make choices, thats it, but the consequences of your choices are not always obvious. PLAY A MASSIVE, WELLTHOUGHTOUT STORY! You start off playing a character in search of glory and loot, but soon delve into a world of deadly conspiracy and parallel universes. Later, the story continues as you switch to playing a succubus (demon), and then a rogueeach with their own personality and goals. Also, theres more on the way! Like a good D&D campaign, it doesnt end. ACTUALLY FREE AND NO PAYING FOR A CHOICE. Play well and you will be rewarded with the currency you need to finish everything without spending a penny. Hunt down those achievements, get the high ranks, and choose to watch the rewarded videos as they become available. Not that I dont appreciate your monetary support and Im confident that you will find it well worth it, but know that you do not have to. Unlike many choicebased games, you do NOT spend currency to make choices. No choice is walled off from you for need of gems, etc. nor is there any such hint to spoil which is the better choice‌. You choose! To succeed, you must put yourself in the boots of your character and do whats best for him or her, even if its not what you would normally do. This requires more than logic, but also empathy for your character and the situation he/she finds themselves in. This is roleplaying in its purest form. EASY ON BATTERY AND STORAGE. EVEN PLAY OFFLINE! Although this is a huge interactive story, offering many hours of enjoyment, its a tiny download and you can even play offline. 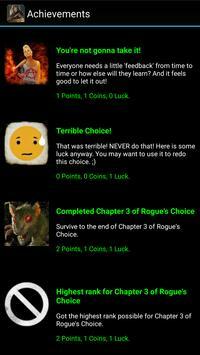 This package of textbased games includes the entire Wizard's Choice series (6 large adventures), Demon's Choice (6 chapters so far), and all of the Rogue's Choice series (9 chapters so far). Although you can find these stories elsewhere by Delight Games, this package was created specifically to deliver the Ring City Universe of stories, enhanced with new features including achievement/point progress tracking. Also, this package has been designed to be a free game where you refresh your virtual currency with your achievements and through rewarded videos. 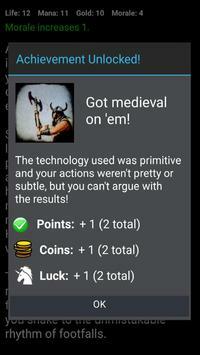 This is the ultimate package of Delight Games interactive fiction for you medieval fantasy fans. Please review Medieval Fantasy RPG (Choices Game) Game and submit your comments below. We will collect all comments in an effort to determine whether the Medieval Fantasy RPG (Choices Game) app is reliable, perform as expected and deliver the promised features and functionalities.